Girls have grown up with Nancy Drew for years. The new Nancy Drew movie, Nancy Drew and the Hidden Staircase, is a great family movie. I really enjoyed it and hope they continue the series. I had the please of interviewing the star of the movie, Sophia Lillis, the other day. Myself and about 10 others were able to ask her a couple questions each. Here are some of the wonderful answers she gave. By the way, Sophia is a doll, she was so sweet and welcoming to all of us. Me: What was your favorite part of playing such an iconic character like Nancy Drew? Sophia: I was able to be light hearted. I put a lot of myself into this character, and had a lot of fun playing her because most of my films are more on the darker side. I got to show my real self more in this film. Me: There were some major life lessons in this movie such as cyber bullying, but also a lot of girl power. Have you ever had to deal with this or do you know anyone that has had to deal with this? Sophia: I haven’t had to deal with this nor do I know anyone that has. I do like how she handled it, it may not have been the best way to deal with it, but it was a fun way to deal with it. As for the girl power, I think everyone should follow their passion, boy or girl and don’t let that stop you. Interviewer: Will there be more movies in the Nancy Drew series? Sophia: I hope so, I think it’s a great family movie, great for the new generation. With so many books and so much content, I feel there will be more movies, and I would love to play this part again. Interviewer: Who is your roll model and why? Sophia: As far as actors – Bill Murray. I love the way he goes about life, he is very free in what he is doing. He loves what he does, and he tells the stories great. I really love his work. He’s been in a lot of comedic movies and I would love to do a comedy and be the comedic version of Bill Murray. Interviewer: Is your mom supportive of you acting and do you get a long great with her? Sophia: Ha Ha, yah, she is sort of my manager, she helps me a lot. She reads all the scripts and helps me practice and goes to all the auditions with me. Interviewer: What is some advice you would give young girls in following your path in acting ? Sophia: Don’t be so nervous, I wasn’t really nervous about acting, but I was during auditions. Will I do ok, will I get it, a whole spiral of negative thoughts. That just won’t help you in life, so I would tell them to not be nervous, it is natural, but try hard not to have that downward spiral. After the death of his wife, Carson Drew decides to leave Chicago behind and make a fresh start with his daughter in River Heights. But for 16-year-old Nancy Drew, life in a small town is mighty dull. She longs for excitement, adventure, and the chance to make a difference. Nancy gets that opportunity when she is asked to help solve the ghostly activity at the Twin Elms Mansion. Can she help explain the creaking footsteps, exploding lightbulbs and the ominous creature? Is it the handiwork of high-school bully Derek Barnes? Or is it possible that the ghost of original owner Malcolm Colfax is back for revenge? Recruiting her best friends, George and Bess, along with local “mean girl” Helen, Nancy Drew is on the case! 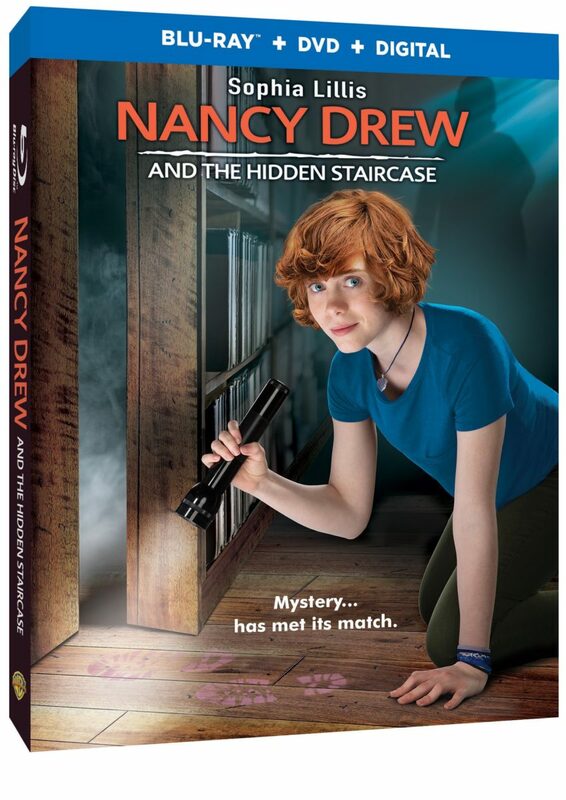 Nancy Drew And The Hidden Staircase is on Blu-ray™ Combo Pack & DVD on April 2, 2019. April 3, 2019 April 3, 2019 adeinaandersonLifestyle, Mediablu-ray, book, books, dvd, Hidden Staircase, movie, movie release, Movie review, movies, mystery, Nancy Drew, warner bros. I have always been a mystery bluff and loved Nancy Drew when I was younger. I did too. I loved this movie, and still love the books. Me too, I loved them.